The Honeywell Smart Color Thermostat brightens up your room while saving you some cash at the same time. The typical American home spends half of their energy costs on their heating and cooling, which can add up to more than $900 each year. A smart thermostat can reduce this cost by learning your temperature preferences and using other energy-saving features. Recently, we’ve seen an increase in the number of smart thermostats available to customers. Some look like regular old thermostats with old school calculator-like display screens and cost $100 or less, while others, like those offered by Nest and Ecobee, are higher priced and have more advanced features and designs. We tested out the Honeywell RTH9585WF1004 Thermostat ($200) for a period of six months to evaluate its performance, ease of use, features, and ability to serve as a money-saving device. Here’s how it went. When you open the box, you’ll find virtually everything you need to get the unit up and running. In addition to the thermostat, which measures 4.5 inches wide by 3.5 inches tall by 0.8 inches deep, you also get an ID card for the thermostat, a wall plate, screws and anchors, wire labels, and a user guide and quick start guide. While its features and app design are somewhat simplistic, the thermostat is a solid and reliable addition to your smart home that will save you money, and you don’t have to read a giant manual to understand how to operate the device. Installation takes about 30 minutes to an hour, and the instructions are clearly laid out in the user guide. It’s designed for a do-it-yourself install, and if you can put in a basic light fixture, you can install this thermostat. The only tool you really need is a screwdriver, but you do need to have a C wire available. As long as you have a C wire and label the wires correctly based on where they were on your old thermostat, install isn’t too difficult. To install, switch off the power to your heating and cooling system, remove the old thermostat faceplate (but leave the wires connected), label the wires, remove the old wall plate and mount the new one, attach the wires to the new thermostat, attach the thermostat to the wall plate, and then restore the power to your heating and cooling system. The wiring is the most difficult part of the installation process. But as long as you have a C wire and label the wires correctly based on where they were on your old thermostat (not based on their color), install isn’t too difficult. 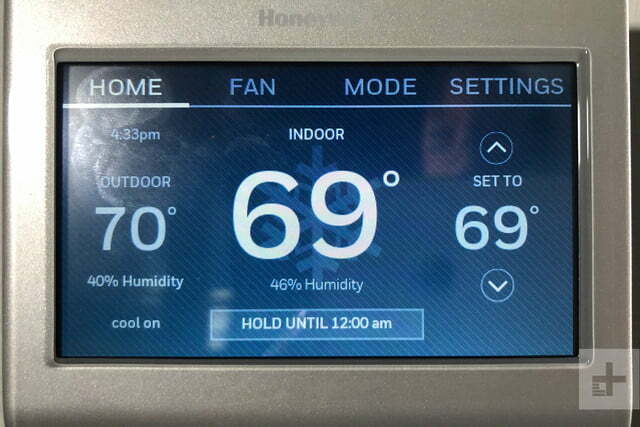 After you get the thermostat installed and connected, you just connect it to your Wi-Fi network, go through the app setup, and connect it to your smart home network. The screen is in full color, and there are several different themes to choose from. The screen color is rich and vibrant, and it gives the thermostat a more expensive and high-tech appearance. The touch screen display is responsive, but don’t expect the responsiveness you’d get with a device like an iPhone. You may have to occasionally press a button twice to initiate a command, and sometimes you annoyingly have to touch the button “just right.” But overall, the backlit screen is functional and attractive, and the few extra button touches here and there take little away from the overall experience. 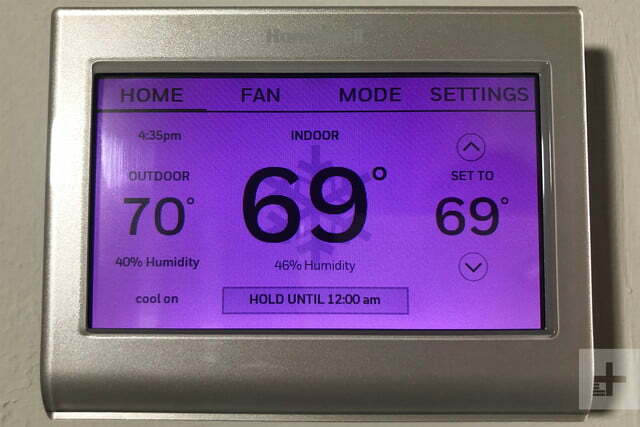 The main screen displays the indoor temperature and indoor humidity level, the temperature and humidity level outside, the time, and the temperature at which your thermostat is set. While the RTH9585WF1004 is an improvement over its predecessor, it lacks some of the advanced features you get with other smart thermostats. If you go you tap the Weather option, you can see a more information about the day’s weather forecast. You can have the system remind you to replace your air filter or your humidifier pad, and it will alert you in the event of extreme high or low temperatures. You can check the status of your heating and cooling equipment or program a schedule directly into the thermostat touchscreen panel. 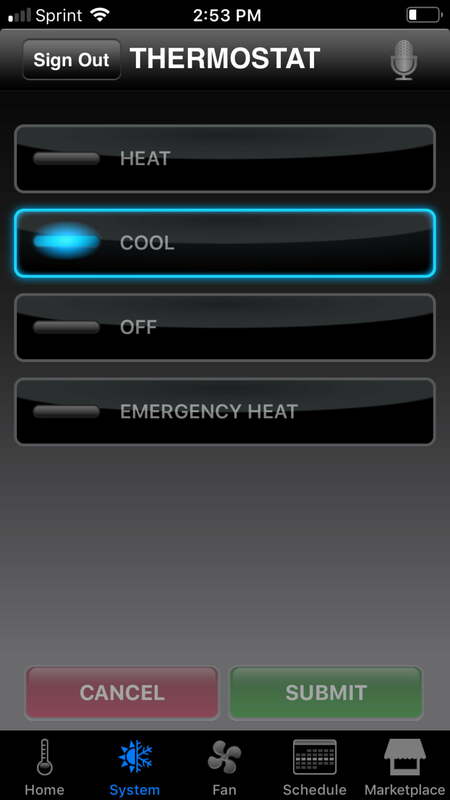 Smart Response Learning also allows the thermostat to learn your heating and cooling cycle times. While the RTH9585WF1004 is an improvement over its predecessor (the RTH9580WF), it lacks some of the advanced features you get with other smart thermostats. It doesn’t come with geofencing, for instance. It also doesn’t have Alexa’s voice built-in like the Ecobee4 does, nor does it have room sensors or advanced motion sensor capabilities that can detect movement in specific areas of the home. 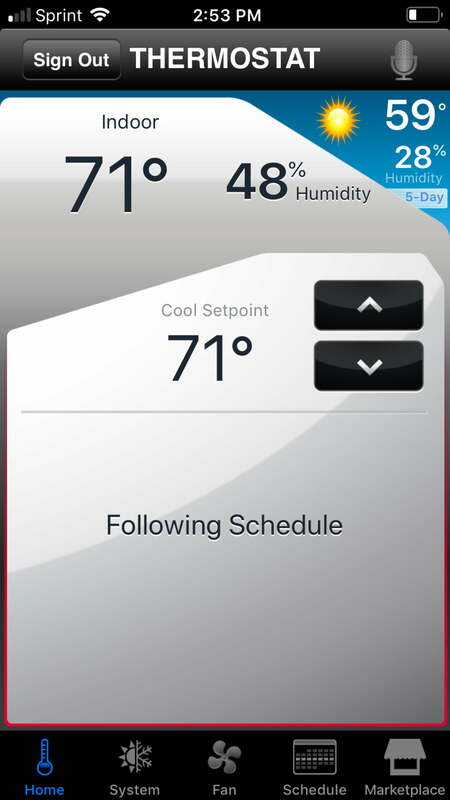 The Honeywell Total Connect Comfort app (available for iOS or Android) lets you control your thermostat from your phone or tablet. 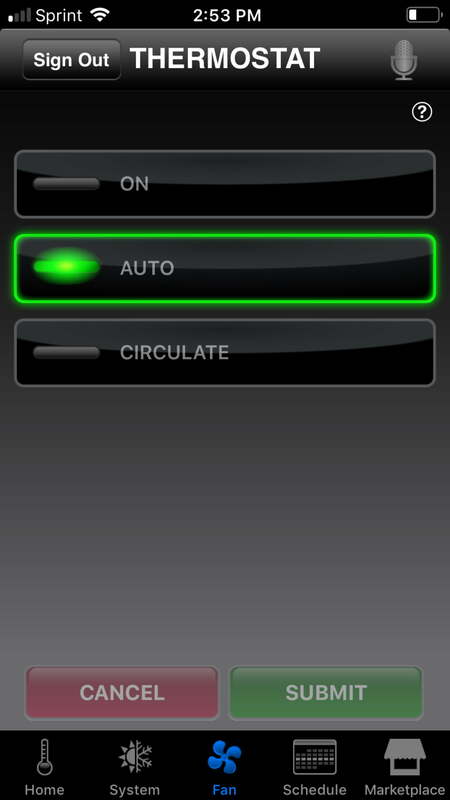 It has a basic voice control feature, or you can use the on-screen controls in the app. 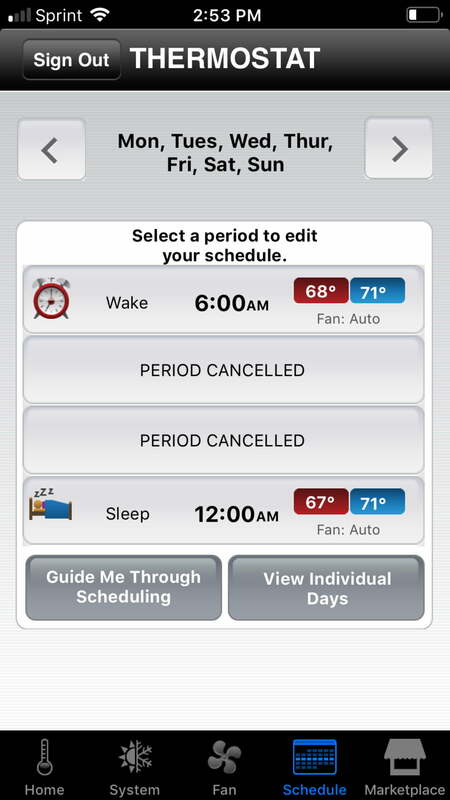 The Total Connect Comfort app also lets you do things like view the 5-day weather forecast, set up automatic air filter shipments, and create a schedule. The app will guide you through creating a schedule, or you can customize it day-by-day. It’s very simplistic, but it’s also easy to use because of its simplistic design. While it’s not an Alexa speaker, you can use the thermostat with Alexa to create routines. In fact, it’s compatible several with smart home platforms, including Alexa, Google Home, Smartthings, and IFTTT. 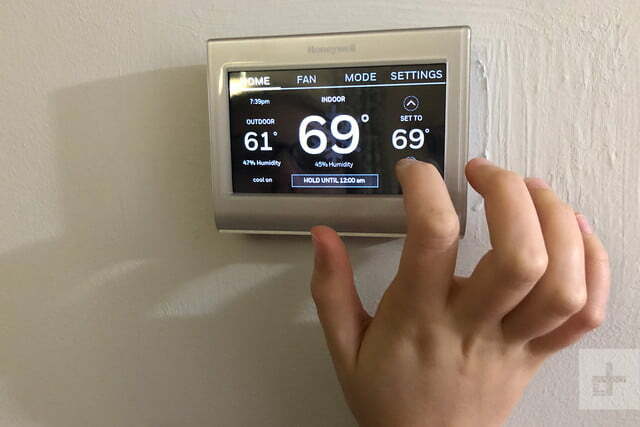 Once you set it up on your smart home network, which takes just a minute or two and involves simply connecting your app account to your Alexa account (or other smart home system’s account), you can voice-control your thermostat. It’s compatible several with smart home platforms, including Alexa, Google Home, Smartthings, and IFTTT. You can say things like, “Alexa, what is the thermostat set to?” “Alexa, decrease the temperature by 5 degrees,” or “Alexa, turn on the air conditioning.” You have little need to get up and adjust the thermostat because there are voice commands to cover virtually every situation. 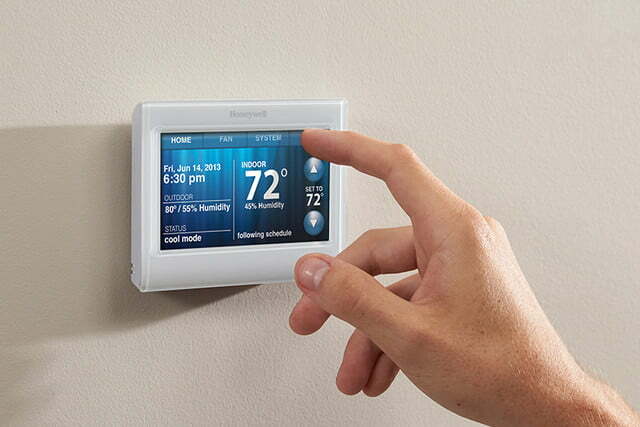 The Honeywell Smart Color Thermostat is Energy Star Certified. We installed the thermostat in the beginning of November. Since then, we’ve monitored our energy usage and compared energy consumption to the same months during the previous year. From November 2017 to March 2018, the reports indicate we used an average of 1407.8 kWh per month. However, between November 2018 and March 2019, we used an average of 1197.8 kWh per month. This means there’s a decrease in kWh consumption of around 15 percent. The Honeywell RTH9585WF1004 Smart Color Thermostat comes with a one-year limited warranty. The Honeywell Smart Color Thermostat does exactly what a smart thermostat is supposed to do. It’s energy efficient, it saves on heating and cooling costs, and it makes it easier to control your heating and cooling system with smart features like app and voice control. This unit does, however, lack some of the bells and whistles you’d get with other smart thermostats like geofencing and motion detection. If you want a thermostat with more bells and whistles, you may like the 3rd gen Nest Learning Thermostat. It has several cool perks, including a “Farsight” feature that uses built-in sensors and lights up the thermostat when you’re in the room so you can easily read the display. If you want a thermostat that doesn’t require a C wire, you might want to check out the Ecobee4. It comes with an adapter as a work around if you don’t have one. The Ecobee also has Alexa built right into the thermostat. You can read more in our full review of the Ecobee here. Although it’s somewhat simplistic in terms of the features it offers, it’s exceptionally user-friendly, and the hardware is durable. Plus, considering the first-generation Honeywell Smart Color Thermostat is still for sale in several stores and the RTH9585WF1004 is the second-generation version, this thermostat shouldn’t be going anywhere anytime soon. Yes. 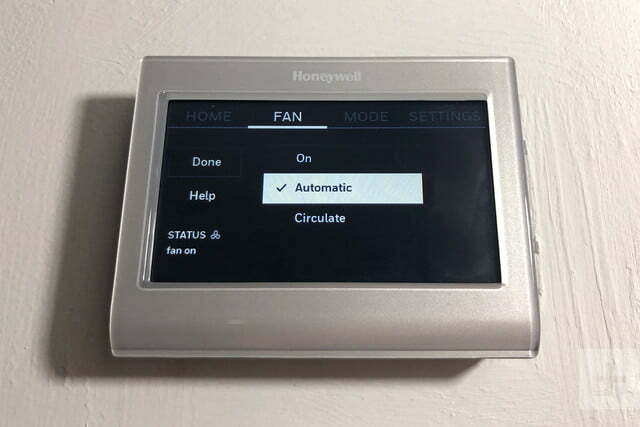 If you want a simple and easy-to-read thermostat that gives you the ability to adjust your thermostat settings while you’re sitting on your couch or laying in bed, you’ll like the Honeywell RTH9585WF1004.